The ISO 45001 draft, international standard for occupational safety and health management systems, is likely to go to the FDIS status by November 30, 2017 and the final release to be launched in March 2018. The working group that is part of ISO/PC 283 – the project committee developing the new standard – met from the 18th to the 23rd September in the Malaysian city of Malacca. At this meeting, ISO/DIS 45001.2: 2017 was subject to a ballot, with a positive result. 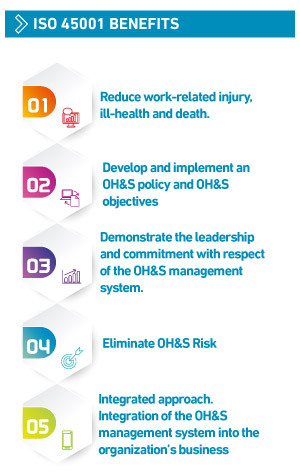 ISO 45001 is expected to replace the British Standard OHSAS 18001. A three-year migration period is anticipated after the publication of the final standard. ISO 45001 will join a suite of harmonized standards for management systems, including ISO 14001 for environmental management and ISO 9001 for quality systems. E-LEARNING. Our e-learning programs can be taken when needed. With our Learning Managemen,t System you are able to manage your own experience. DIGITAL TOOLS. On-line tool based on the new requirements so you can self-assess current compliance in your Management System against the requirements of the new ISO 45001 standard, chapter by chapter, clause by clause. AUDITS. Our Audits are an opportunity to validate your understanding about the new requirements of the Standard and to certify your new ISO 45001 Management System. DIGITAL PACKS. The Bureau Veritas Certification experts have created a full-service offer to provide the best tools for all organizations to manage successfully the migration. The Digital Pack combines e-learnings trainings and tools to assess the gap between the current situation and the future standard. Bronze, Silver, Gold - Three tiers of Digital Packs have been designed to address a range of needs. In Bureau Veritas and the LEAD, Project we will keep you informed of all news of ISO 45001. Join our community on Linkedin and Twitter to be updated.